Robert Meno Hunt, 84, died on Monday morning, November 2, 2009 in Winters, TX. 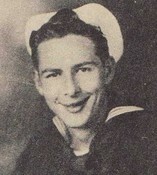 The son of the late Wayne and Minnie Hunt, he was raised in Bradshaw, TX leaving to serve in the Navy during WWII and later pursuing a career that took him all over the world. He returned to Taylor County in 1976 when his assistance was needed. He is also preceded in death by Joy Dorothy Jolissaint, his wife of 55 years. Survivors include his beloved wife and companion, Lenora Higgins Hunt, a Son and daughter-in-law, Wayne and Dahelia Hunt, daughter Melanie Hunt, step-son William (Pete) Higgins and Step-daughters Nancy Ward, Barbara Vaughn and Susan Shepard. His grandchildren include Shane, Slade, Tamara Joy and Josh Hunt, and he has 3 great grandchildren. Other survivors include a cousin, Olivia Horn and her daughters, Cathy Forbes and Mindy Brent. A Robert Meno (Bob) Hunt Memorial gathering will be held on Saturday, November 28th, 1:00PM, at the family's old Audra Mercantile in Bradshaw, TX. To celebrate a life so well lived, friends and family will gather to dine and reminisce after the service. In lieu of flowers, the family requests memorial donations to be made to the Bradshaw Cemetery Association or Hospice of the Big Country.